We’ve been experiencing a bit of radio silence over here in Football Foodie land after the Super Bowl, and for that I apologize. I’ve been trying to wrap up a few other projects this month that sadly don’t involve cooking and posting recipes, but now that it’s Bracket Season* we all have an excuse for a little extra snacking to go along with our sports. 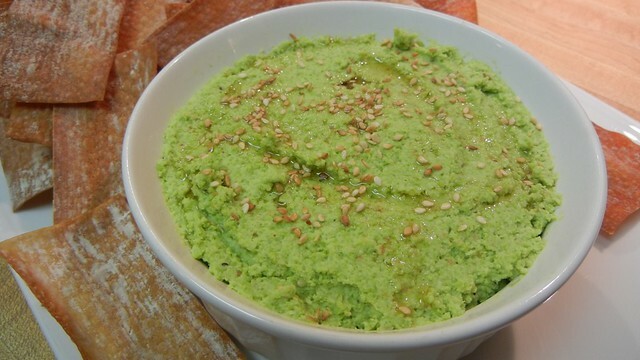 I’ve had a lot of different edamame hummus dips over the years, but the ones that always taste the freshest are the ones that forgo tahini — as I have said many times in the past, if it doesn’t have tahini, it isn’t really a hummus, and are really just an edamame dip. Edamame and toasted sesame seeds go together like two very different plant seeds or brother from another tree mother in a pod. 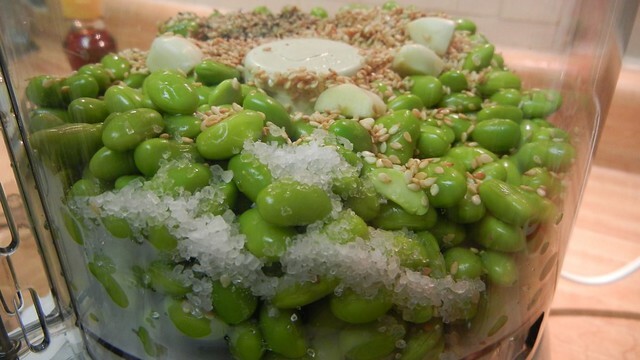 The brightness of the edamame is enriched with the smokiness of the sesame, then made a touch sharper with the lemon and the salt. If you want to add a little heat with some cayenne or add some cumin you can, but you run the risk of overpowering the earthiness of the soybeans and the complexity of the sesame. 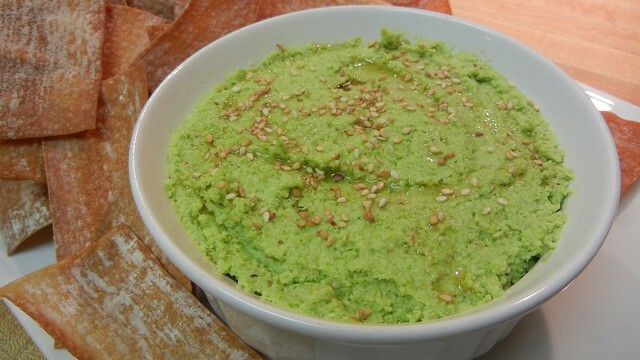 Sure, you could argue that toasting sesame seeds and then blending them into your dip is just about the same as using tahini (which is ground sesame seeds), but the taste profile in this dip more nuanced and layered than if you you were to just throw a tablespoon of tahini in the mix. I usually buy frozen shelled edamame, cook the beans in boiling water with a pinch of salt for about five to six minutes, drain, and then immediately run under cold water to cool so they do not become over-cooked and mushy. When shopping for sesame oil, I’ve found that grocery stores tend stock it in both the olive oil section and ethnic food aisles. Large, expensive bottles of sesame oil are always next to the olive oil where the $9 -$12 price point doesn’t seem out of line, but if you walk over a few aisles to the other side of the store and look in Asian food section, you can usually find much smaller bottles that are cheaper per ounce. One clove of garlic is enough. Resist the urge we all have to make “50 Cloves of Garlic and By The Way There Is Also Some Edamame In Here Too” dip. Cook the shelled edamame according to package directions (which will vary if you bought frozen or fresh), cool immediately in cold water and then drain. 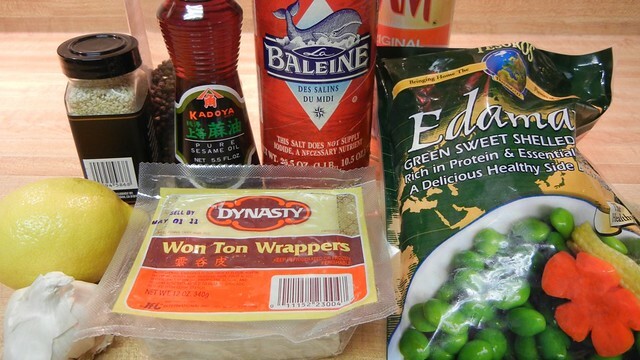 While preparing the edamame, while the wonton wrappers are still in their “block”, chop them in half and then separate into individual slices. Place on a lined cookie sheet and very lightly brush with oil or just lightly spray with cooking oil. Bake in a 325º oven until golden brown, about 7-10 minutes. Set aside for serving. 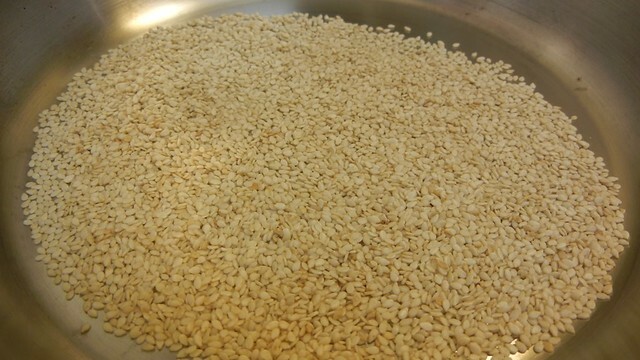 Toast the sesame seeds in dry skillet over medium heat, tossing in the pan every few minutes. Eventually you’ll hear a light cracking sound and the seeds will become fragrant while taking on a golden brown hue. Remove from heat once toasted. Set a aside a pinch of the seeds to use as a garnish. 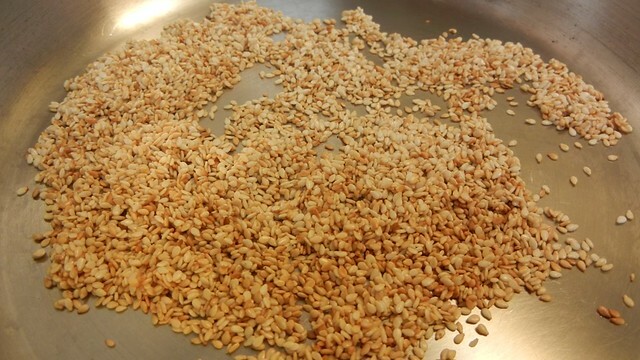 You can buy toasted sesame seeds, but they’re never as fresh tasting and you need to use much more of them get the right amount of impact sesame in your dip. Avoid them if possible and toast them yourself. 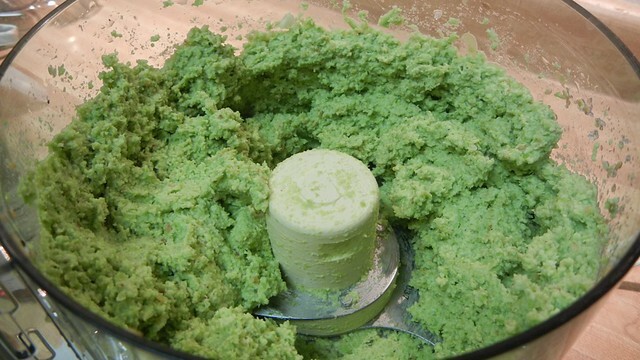 In either a food processor, chopper, a traditional blender, using a stick blender in a bowl, or if you have the strength and the patience, a hand pastry cutter, combine the cooled edamame, toasted sesame seeds, a clove of garlic, ground pepper and 1 teaspoon of sea salt. Blend until combined and the beans have taken on a paste-like thickness. Drizzle in the sesame oil and the lemon juice and blend again until the dip has reached a nice, thick consistency. Taste for seasoning, adding more salt if needed and blend again. (Disclosure: I always add the second teaspoon of sea salt.) If you would like a thinner dip, blend with a tablespoon or so of cold water. Top with a light drizzle of sesame oil and the remaining toasted sesame seeds. Serve with the wonton chips. If you don’t feel like bothering with the wontons, this dip is also excellent with endive leaves, rice crackers or even unsalted pretzels. This dip can be made a few days ahead of time and refrigerated and is find served either cold or at room temperature. i would think adding a touch of wasabi would give it a little burst of flavor. not a lot, just a bit. my friend also suggested some garlic. HA on more garlic than already called for. Good idea on the wasabi though. I usually don’t put it in anything, not even my sushi.